CPCC Summer Theatre is in full swing for 2015 for our 42nd season with an amazing array of new and returning talent. Oliver! runs through Satruday the 13th. Anything Goes opens June 19th. Around the region our alumni are busy as well. On Stonewall Street at Actors Theatre Erica Ross is appearing in Cougar the Musical. Uptown at the Booth Mike Collins, Susan Roberts, Patrick Ratchford, Kevin Harris and Lucia Stetson are making mock in the latest edition of Charlotte Squawks. Kevin Roberge, KC Roberge and Emily Hunter at slinking about at Community School of Davidson in Cats. On the other side of Davidson Corey Mitchell is directing Chicago for the Davison Community Players. And I’m sure there are alot more. So while you are making your entertainment plans this summer besides coming in to see what is happening here at CPCC Summer Theatre give a look and a shout out to our wonderful alums alive and well on stages everywhere. 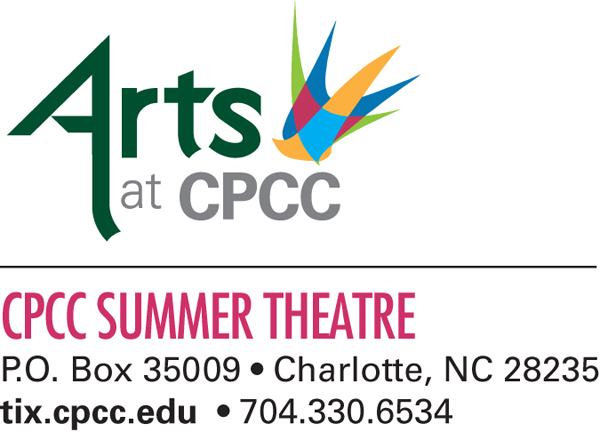 Get your tickets to CPCC Summer Theatre 2015 at the SunTrust Box Office 704-330-6534 or online at tix.cpcc.edu. And while you’re at it bring a friend. The gift of theatre never stops giving! We would like to thank everyone who auditioned for us this year. We hope to see all of you again at future auditions. Season Tickets are onsale for Summer Theatre 2015 at the SunTrust Box Office 704-330-6534 or onoine at tix.cpcc.edu. Single tickets go onsale May 1st. 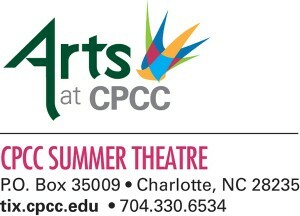 CPCC Summer Theatre will hold auditions for actors, technicians and interns for the summer 2015 season on Saturday February 21st from 9:00am to 3:00pm by appointment only. Actors and Interns from 16 to 60+ are needed for a season of 5 shows. A separate audition will be held for performers under 15 on TBD at 5:30pm. Paid and Intern technical positions in stage carpentry, stage management, scenic painting, props construction, lighting, wardrobe, running crew and costuming are available. Interviews for tech positions will be held starting at 11:00am. Technicians sign up upon arrival. Roles are available in all shows. Prepare a song and monologue. No more than 90 seconds for both. 16 bars of music preferred. Be prepared to dance. An accompanist will be provided. No tapes or CD accompaniment allowed. Bring sheet music in the correct key. If auditioning for Boeing Boeing only, all that is required is a monolog. Those auditioning for Boeing Boeing only report at 11:00am or 3:00pm. If you want to be considered for Boeing Boeing and other shows in the season you must make an appointment to sing and attend the dance call. Oliver! will start rehearsal on April 20th in the evenings Sunday – Thursday until opening. Anything Goes rehearses day times 9:30a to 4:30p Monday – Saturday starting June 1st until opening. Boeing Boeing and Beauty & the Beast Jr. rehearse daytimes 9:30a to 4:30p Monday – Saturday starting June 15th until opening. Mel Brook’s Young Frankenstein rehearses Monday – Saturday 1:00pm to 4:30pm and 6:00pm to 9:30pm starting June 30th until opening. We are looking for actors to appear in the entire season as well as performers for single shows. You must be available for day time rehearsal to work in all shows except Oliver!. The performance season runs from May 25th to July 27th for actors. Technicians must be available starting May 18th. For further info on the Intern program please visit our website at http://blogs.cpcc.edu/theatre/auditions/cpcc-summer-theatre-auditions/intern-auditions/ Intern schedules may vary. Payment for roles varies according to the size and number of roles played during the season. Housing is provided for actors and technicians outside the 10 county Metrolina area who are hired on a seasonal contract. College credit is available for those who qualify. Internships are non-paying. For more information contact Tom Hollis at the number above or by email at tom.hollis@cpcc.edu. CPCC Summer Theatre is a non-Equity summer stock company presenting a season of musicals and non-musicals to the Charlotte Metrolina area. 2015 will mark the 42nd anniversary of the company. Visit our website at http://blogs.cpcc.edu/theatre/ for more info about the program. CPCC Summer Theatre happily announces our 42nd season of summer stock for the Charlotte Metrolina region during Summer 2015. Broadway and Hollywood have joined together over the decades to create some of the greatest musical entertainment ever conceived. CPCC Summer Theatre 2015 celebrates that great collaboration this summer with a selection of the best both Broadway and Hollywood have to offer. Join us this summer for a Brollywood tune filled romp as the tradition of great family theatrical entertainment continues at CPCC Summer Theatre 2015. CPCC Summer Theatre kicks off its 42nd season with one of Broadway’s and Hollywood’s greatest hits- Oliver! Based on the Charles Dickens novel, Oliver! engages the audience with its pathos and drama, while delighting everyone with its outstanding musical numbers. “Food, Glorious Food”, “I’d Do Anything”, “Where is Love?” , “Consider Yourself” , “As Long As He Needs Me”, “Who Will Buy” and “Reviewing the Situation” are musical theatre classics. Dickens’ characters are brought to life — perhaps larger than life — with all their facets glowing in this production. Get your tickets now as Summer Theatre brings your favorite movie musicals to life on the stage this summer. The age-old tale of Boy-Meets-Girl and the complications which ensue have intrigued audiences for generations, and no musical puts it on stage better than Cole Porter’s Anything Goes. This tap happy show tells this amusing story wrapped around one of Cole Porter’s most magical scores. It’s a wonder that all the romances are sorted out and disaster is averted aboard the magical ship where Anything Goes! Opening on Broadway in 1936, Anything Goes has entertained audiences every decade since as one of the most revived shows in Broadway history and with two film adaptations both staring Bing Crosby has been enjoyed as much onscreen as onstage. Join us for this perennial CPCC Summer Theatre favorite as we tap dance our way across the deep blue sea. Be Our Guest! The Academy Award-winning film Disney’s Beauty and the Beast comes to life in this romantic and beloved stage adaptation of the classic fairytale. Step into the enchanted world of Disney’s Beauty and the Beast Jr. this summer with CPCC Summer Theatre. Featuring songs from the Academy Award-winning animated feature film as well as many new numbers, this “tale as old as time” follows Belle, a resourceful young woman in a provincial town, and the Beast, who is really a young prince trapped under the spell of an enchantress, as they lead us on a merry adventure as only the wizard’s at Disney can envision. Fun for all ages comes to the Halton stage this summer in Disney’s Beauty and the Beast Jr. The Tony Award winning farce Boeing Boeing takes us back to the swinging 1960s to meet confirmed bachelor Bernard who couldn’t be happier with a flat in Paris and three gorgeous stewardesses all engaged to him without a clue about each other. But when a new and speedier Boeing jet throws off all of his careful planning, all three stewardesses are in town simultaneously, and catastrophe looms. In 1991 The Guinness Book of Records named Boeing Boeing the most produced French play in history. With no fewer than 5 film adaptations (French, American with Tony Curtis and Jerry Lewis, Malayalam, Telugu and Hindi), Boeing Boeing proves that laughter knows no language barriers. Come fly with us as we take a farce filled ride on Boeing Boeing this summer. It’s Alive! This electrifying adaptation of Mel Brooks’ monstrously funny film Young Frankenstein will leave you in stitches. From the creators of the record-breaking Broadway sensation The Producers comes this monster new musical comedy. The comedy genius Mel Brooks adapted his legendarily funny film into a brilliant stage creation – Young Frankenstein! Young Frankenstein the Musical has all the panache of the screen sensation with a little extra theatrical flair added. With such memorable tunes as “The Transylvania Mania,” “He Vas My Boyfriend” and “Puttin’ On The Ritz,” Young Frankenstein is scientifically-proven, monstrously good entertainment. Join us for a hilarious evening of pitchfork raising entertainment. Season Tickets go on sale April 1st. Single tickets go on sale May 1st. Get your tickets now by joining the Performing Arts Society http://cpccfoundation.com/cpcc-arts/. Support CPCC Arts all year long and be first in line for the best quality theatre in town at the a price the entire family can afford. Get your tickets by calling the SunTrust Box Office Monday – Friday 10:00am to 2:00pm at 704-330-6534 or go online to CPCCTix tix.cpcc.edu 24/7. Come along on a magical ride where Hollywood glamour meets Broadway pizzazz as CPCC Summer Theatre 2015 Goes to the Movies!